Middle Village is in the heart of Queens' cemetery land. This New York working-class neighborhood was until recently mostly Italian. But the relatively inexpensive rents and central location have enticed immigrants from Latin America, Poland, and Ireland. This both quiet and bustling neighborhood is home to many of New York's finest. Public transportation options are limited, so most residents drive (and park). And everyone walks to shop and eat on Metropolitan Avenue. You'll find interesting storefronts, especially Italian specialty shops and butchers, on Metropolitan. The main drag that defines Middle Village is Metropolitan Avenue. It's abuzz with small chains and mom-and-pop stores, but it is appropriately quiet on the stretches through St. John's and Lutheran cemeteries. To the east is wide Woodhaven Boulevard and then Forest Hills. Eliot Avenue separates Middle Village from Rego Park to the north and Maspeth to the west. Long Island Rail Road tracks and Cooper Avenue divide it from kindred spirits in Ridgewood and Glendale to the south. The M subway starts at Metropolitan near 69th Street for its long run through Brooklyn to Lower Manhattan. It's at least a 40-minute ride to the Lower East Side. Switch to the L train in Bushwick to reach Union Square in 50 to 60 minutes. The QM 24 and the 24W express buses stop on Eliot Avenue before heading to Manhattan. Middle Village is close enough to the Long Island Expressway and Jackie Robinson Parkway to make driving easy enough. It's 20 minutes to LaGuardia Airport or John F. Kennedy International Airport. The dead have the best land in the heights above the streets. The living struggle with basement flooding, especially around Juniper Valley Park. Row houses and multi-family homes are the most common housing, but waves of development have left no distinct look. Apartment buildings and rarer condos are along Metropolitan and 69th Street. Named for its location midway between Williamsburg and Jamaica, Middle Village got its start in 1816 as part of the larger Newtown community. It didn't take off until burials were banned in Manhattan, and churches bought farmland in the area for new cemeteries. Germans dominated the area and the cemetery businesses until Italian immigrants supplanted them in the 20th century. In 1915 the Juniper Swamp was filled in, becoming Juniper Park and allowing for the development of the surrounding area. St. John's Cemetery holds many well-known mobsters, including John Gotti and Lucky Luciano. Fitness guru Charles Atlas and photographer Robert Mapplethorpe are also interred there. The General Slocum Steamboat Fire Mass Memorial, commemorating one of the worst disasters in New York City's history, is at Lutheran All Faiths Cemetery. For neighborhood pizza, folks pledge fealty to either Rosa's or Carlo's, both of which are much better than the average Queens pizzeria. Rosa's has found fame as the setting for the fictitious Capparello's Pizza, Bobby Axelrod's favorite joint in the Showtime series Billions. Otherwise try the European Deli for hot, cheap Polish food. Middle Village is a safe neighborhood. In the 1970s and '80s, it was said that the Mafia made sure nothing happened. These days burglary and car theft are not uncommon, but violent crime is rarer. 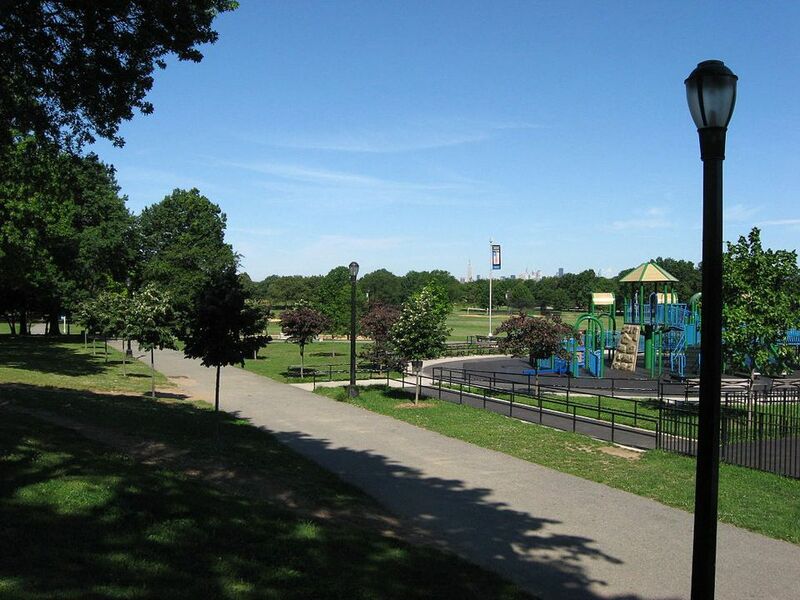 Juniper Valley Park is a gem with 55 acres of baseball and soccer fields; a track; roller-hockey rink; playgrounds; and courts for tennis, handball, and bocce. The track and a few fields are new and some of the best in Queens. Come by any day, even a cold Monday morning in October, to see how bocce is played by the pros. Or go in September for the annual NYC Bocce Tournament. Find Out Where Archie Bunker Lived On TV Show "All in the Family"